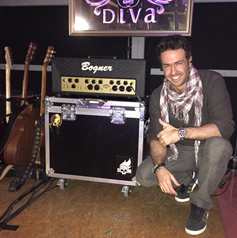 Diva is a german Coverband, well known especially in southern Germany and bordering Switzerland. They play a large variety of shows, from larger stages to small club venues. The band really pays attention to its live sound and therefore was looking for ways to minimize stage volume (without sacrificing tone) especially at smaller venues. As the band uses In-ear Monitoring, the Box of Doom was the perfect solution for guitar applications. Guitars: Gibson R7 and Fender Telecaster.